Yes, you have read that right! 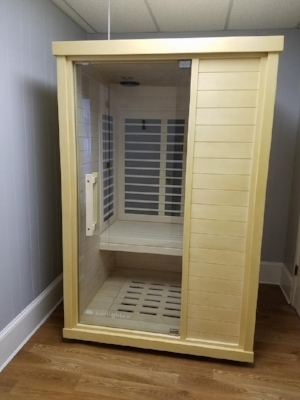 We are now offering Infrared Sauna sessions!! Why is this awesome news?! First, infrared saunas use invisible light within certain frequencies to penetrate and heat up the body’s tissues directly. Infrared spectrums can uniquely affect other positive changes in our cells and organ systems in a way traditional heated saunas can’t. While traditional saunas heat the air or steam to heat the body, infrared saunas use invisible light just below red light frequencies to penetrate and heat up the tissues directly, to a depth of up to 1.5 inches into the skin. Although our eyes can’t see it, we can feel it as gentle, radiant heat. Far infrared (FIR), reaches deepest into the body, where toxins are stored. By raising your core body temperature, FIR stimulates the sweat glands, resulting in a deep, detoxifying sweat that leaves you feeling revitalized. Plus, since sweating increases heart rate, cardiac output, and metabolic rate, you’re also burning calories. Sunlighten already achieved the most effective far infrared heater with their highly emissive Solocarbon heater coating . They’ve applied that same coating to their polyimide panel and discovered that application makes it 99% emissive! This is why Solocarbon panels are the only far infrared heaters clinically shown to raise core body temperature nearly 3° for the most detoxifying sweat, lower systolic and diastolic blood pressure and aid in weight loss.